Welcome to another Comanauts preview! We’ve had a great time exploring the different aspects of your journey into Martin’s mind over the past few weeks as we approach the release of Comanauts. This week we’ll be exploring how Martin’s inner child affects gameplay for the Comanauts, as they attempt to locate the I.D. keeping Martin captive. But first let’s see how Martin’s inner child might appear in a comazone. 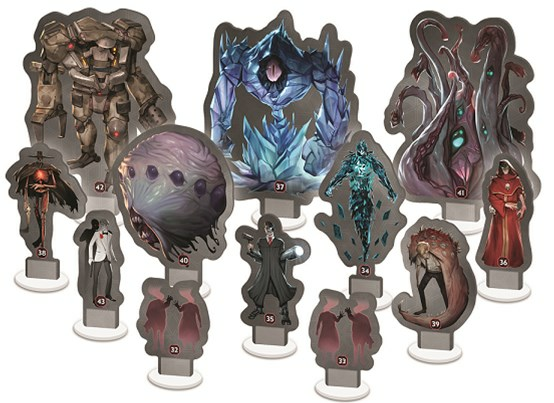 At the start of each player’s turn, they’ll be drawing five dice out of the bag to use on their turn. These dice function in a variety of ways depending on their color. 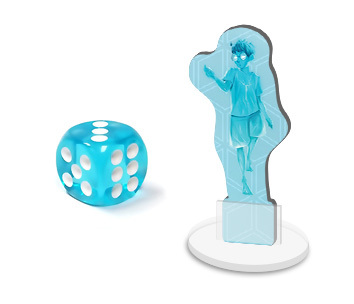 One such die is the translucent blue die. This is the inner child die, and when drawn by a player, it is rolled and placed on the inner child slot of the sideboard. Once slotted, Martin’s inner child standee is then placed on the space of the current page. Each page has a special entry corresponding to the space that players can activate in order to interact with the inner child as it travels from one comazone to another. Successful interactions allow players to draw clue cards, invaluable hints as to the nature of the I.D. and where it might be lurking. Remember, the value rolled on the inner child die will have some bearing on players’ ability to interact with Martin’s inner child, so be sure to approach it with plenty of dice to use on skill tests if need be!